Racing in the Gold Coast felt like racing in my hometown. It was only a one hour flight from our Wollongong, Australia home. The city of Gold Coast reminded me of a city in the USA like Miami, FL, or Myrtle Beach, SC. The Gold Coast WTS was a beach start swim in the Nerang River, which flows into the Pacific Ocean. Depending on the time of day, the tide (and the current) changes. The day before the race, we did our swim preview and the current and wind were so strong that when I stopped in the middle of the race course, I would unknowingly float (be dragged) meters in a matter of seconds. I knew this tide could play a major role in the race, however, on race morning the current wasn’t as strong. 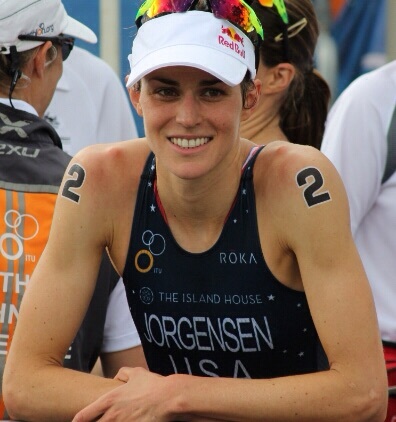 I was honored to wear #2 for the Gold Coast WTS. The #1 slot was left open to honor the great Jackie Fairweather. The #1 bike rack in transition had Jackie’s name, number, and a rose. Jackie passed away in November of 2014. She was a World Champion in triathlon and duathlon, and active in the sport of triathlon after her sporting career ended. Although I never met Jackie, I have a huge respect for what she did for our sport. She was a mentor for my coach, Jamie Turner, and she apparently loved chocolate, which makes her an instant winner. On race morning, I racked my bike in transition across from Jackie’s name and got ready for the race. When the gun sounded, I sprinted and dove into the water. I made it to the first buoy in good position, allowing me to get around the buoys cleanly. I exited the water on the first lap and dove back in for the second lap when I got a blow to the face. My goggles filled up with water and my nose felt like it was bleeding, but there was no time to worry about sharks being attracted to my blood. I just focused on moving up in the pack. I ran out of the water towards transition in fourth. The bike course was extremely fun, with lots of turns and corners we could take at speed. Our bike pack was working relatively well together, trying to stay away from the chase packs, but not without casualty. Early into the race, two girls crashed around one of the corners. I saw the whole thing happen. And I thought, Okay, where can you get around? What’s the fastest open line? I slowed and avoided the crash, but had to work to catch back up with the front pack. Our pack continued to work together and we managed to stay away from the chasers. I served my 15 second penalty and ran off with extra motivation. As I ran down the finishing chute towards the blue tape, I was ecstatic. I couldn’t believe what a great race I had (besides the penalty). I had a great swim, a great bike, and a great run. It’s the way I train to race. And, as if it couldn’t get any better…I turned around to see Sarah True back on the podium in 2nd and Katie Zaferes coming in 3rd for a USA podium sweep! It was pretty special to hear the Star Spangled Banner while standing next to two USA girls. Incredible! 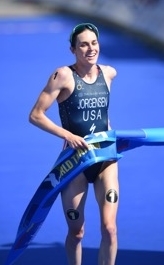 Thank you to all my sponsors for their support, Jamie and Patrick for their daily investments, USA Triathlon, and my family, friends, and fans. Without your help this journey would not be possible. I will miss the next WTS race in Cape Town. I will get in a good block of training before heading to Yokohama for the 5th WTS of 2015 on May 16th. 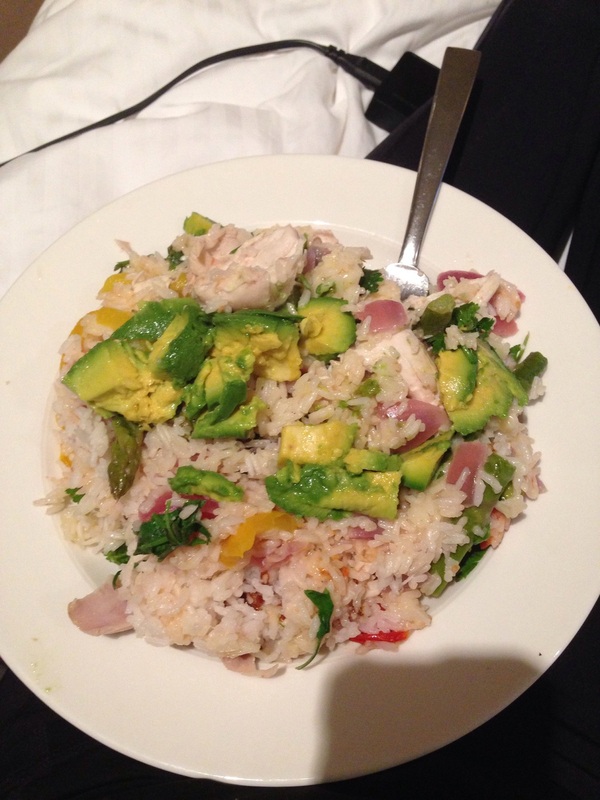 This is the meal Patrick cooked for me in the hotel the night before the race. Yum!